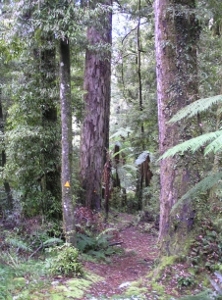 The most robust mainland kokako site outside the central North island is on the Kauri Coast in Northland. 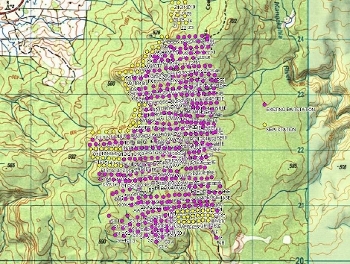 DOC and private landowners have been trapping in the area since 1994 and DOC’s Matthew Calder wanted to extend the grid in the Mataraua area. 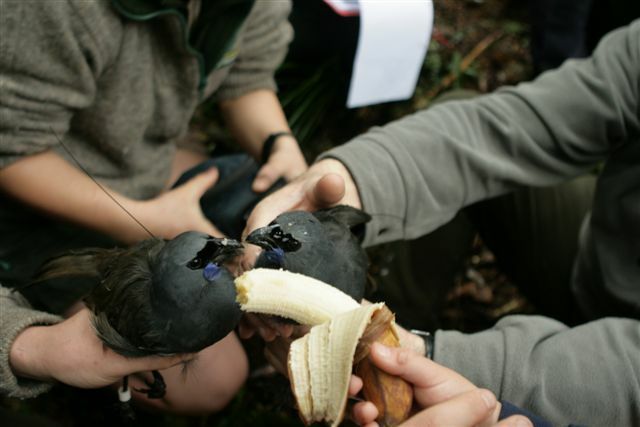 When trapping began at Mataraua in 1994 there were two known kokako pairs. This had increased to 27 by 2007/8 and Matthew Calder asked for funding to extend the trapping area. He organised the cutting of new lines in winter 2009, placing of new stoat and possum traps,and new bait stations, with no fuss. An extra 110 hectares of prime kokako habitat is now protected as best we can. It is hoped that the kokako population in this forest will increase to a self-sustaining level, and indeed provide birds for new translocations. We’re looking forward to the day, maybe soon, when kokako gets a threat rating upgrade. We salute the no-nonsense efforts of Matthew and his colleagues in the field. As an aside, Matthew reported finding a kiwi chick in the immediate vicinity of one of the new stoat traps (which caught two big male stoats immediately after installation). The forest has also been confirmed home to both long- and short-tailed bats. 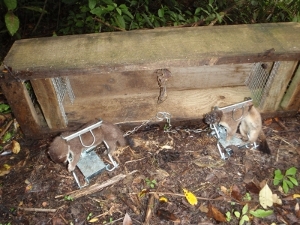 Best-practice trapping done under the kokako banner also has whole-ecosystem benefits. Boundary Stream is a closely-managed mainland island with some resident kokako. DOC’s John Adams and Kahori Nakagawa wanted to improve genetic diversity with a transfer from a nearby kokako stronghold. 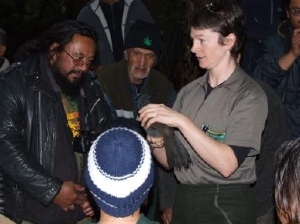 In August/September 2007 a DOC and volunteer catching team mist-netted ten kokako at the Otamatuna Mainland Island area of Te Urewera. Kokako are robust and stoic birds and they were able to cope with being held in an on-site aviary while disease screening was completed. They also dealt with the switch to an unfamiliar, albeit appetising, diet of jam in water, dry bird mix, banana, grapes, oranges, and waxmoth larvae as well as natural vegetation. Once the holding period was complete, the logistics team battled falling snow, and even a broken leg sustained by a member of the catching team, to get the birds choppered over to Boundary Stream and released. All ten were carrying transmitters and were monitored for as long as the signals were being received. Transmitter harnesses were set up to fall off easily, and ongoing monitoring will rely on sightings and reading of colour band combinations. One of the transferred females paired up with an already-resident male and they raised two chicks in the first season since translocation. 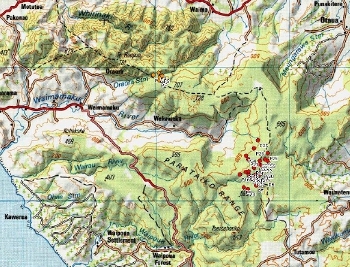 The total population exceeded 30 at last report. Whirinaki and Pureora were the foci of a pivotal battle by environmental activists, a member of our family included, to prevent further clear-felling of native forests. More than 30 years on, what’s left of Whirinaki is having some wrongs redressed. If you’re old enough you will remember TV coverage of the 1970s protests, particularly a government forester in front of a scene of devastated forest, saying on camera that there were no kokako in the region, so he couldn’t see what the fuss was about. Then a no doubt homeless and doomed kokako flew down behind him. 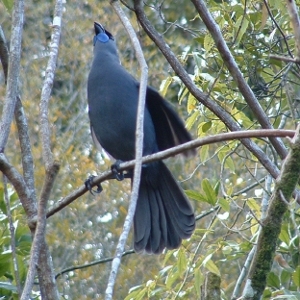 To more enlightened times, in 2009 Sarah King from DOC thought the time was right to reintroduce kokako to the lowland podocarp forest of Whirinaki. Otamatuna in Te Urewera holds a thriving kokako population, ripe for harvest and spreading around with the support of gifting iwi Tuhoe. 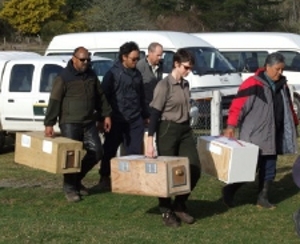 The birds were caught in late winter through spring 2009 and moved to the core protected area in Whirinaki, after a welcome by Ngati Whare at Murumurunga marae. Five birds died shortly after transfer for no obvious reason. Acoustic anchors were placed around the site by students from Waikato University, and the transmittered kokako were tracked for four months by DOC staff and volunteers. Four pairs and two singles established territories within Whirinaki and three pairs fledged chicks, for the first time in 60 years in Whirinaki. Release day. Almost not before in their lifetimes. With the perversity we are getting used to with attempting to impose human will on wild animals, the kokako located themselves outside of the core trapped area and needed expanded predator control to help them survive and continue to breed. Sarah King wanted us to front for 130 DOC200 stoat traps and associated materials to protect the most easily accessible three pairs. These went in in time for the 2010-11 breeding season, and we are pleased to report that all three pairs nested and fledged their chicks again. Mokoia is in the middle of Lake Rotorua, a major tourist destination. It is capable of being kept pest-free, and DOC’s Bridget Evans made a compelling case for moving kokako there, giving conservation and advocacy benefits. 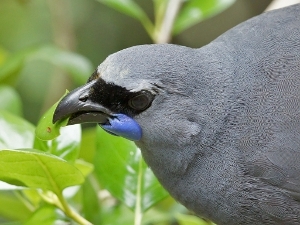 For this project, the source population of kokako was initially Kaharoa. DOC’s Jeff Hudson commenced catching there in May 2006. In this case, disease screening threw up the wrong result in the captured birds and the transfer was canned. This result shows the benefit of being careful, as to spread a bird disease around just to report a successful transfer is not what the bird experts or we are about. Our involvement with the project ended at this time, but DOC was able to organise funding for a translocation from Tiritiri Matangi in 2007, which went ahead with no problems. Perhaps Mokoia will become a great place for tourists to encounter kokako and gain an appreciation for our troubled natural environment, in conjunction with a moving exposition of Mokoia’s sometimes violent human past if they sign up with the right tour guide. Funded by Fauna Recovery New Zealand ($55,000). Jeff Hudson travelled to Wellington to make a compelling and impassioned case to us for funding kokako work when we began this mission in 2002. Jeff has since died and we remember his contribution with respect.